Twizzlers Twists Sugar-Free Candy is the perfect snack for at home, in the office, and on the go. Satisfy your sweet tooth without the sugar! Tie a ribbon around each bag of Twizzlers Twists Sugar-Free Candy, then use them as sweet party favors. Bite off each end and use a piece of Twizzlers Twists Sugar-Free Candy as a straw for your favorite diet soda. Store a bag in your glove box to satisfy snack attacks when you’re on the road. 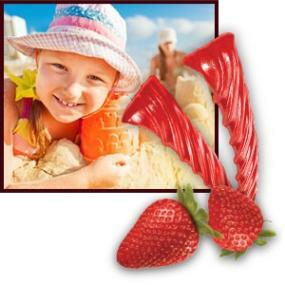 Twizzlers Candy was born in 1845 with the establishment of the Young & Smylie candy company. The Hershey Company acquired Twizzlers Candy in 1977, and later introduced Twizzlers Pull ‘N’ Peel, Twizzlers Nibs, and other much-loved candy products. Today, Twizzlers is the Twist You Can’t Resist, whether you’re enjoying a classic twist, the rip-roaring fun of a Twizzlers Pull ‘N’ Peel, or the tangy taste of Sweet & Sour Filled Twists. You can even use Twizzlers Candy for crafts and baking, or bite the ends off to make a straw. 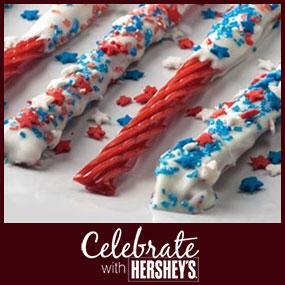 Sprinkle on the fun with these dipped Twizzlers Twists! 1. Melt chips in microwavable glass bowl. 2. Dip Twizzlers Twists in melted chips, one by one. 3. Place dipped Twizzlers Twists in a single layer onto cookie sheet. 4. Top with sprinkles while the Twizzlers Twists are still warm. 5. Serve or save for later between sheets of wax paper.